The humble charcoal drawing, a starting point for most artists or art enthusiasts, has seen one of South Africa’s most prolific contemporary artists, William Kentridge, rise to international fame. 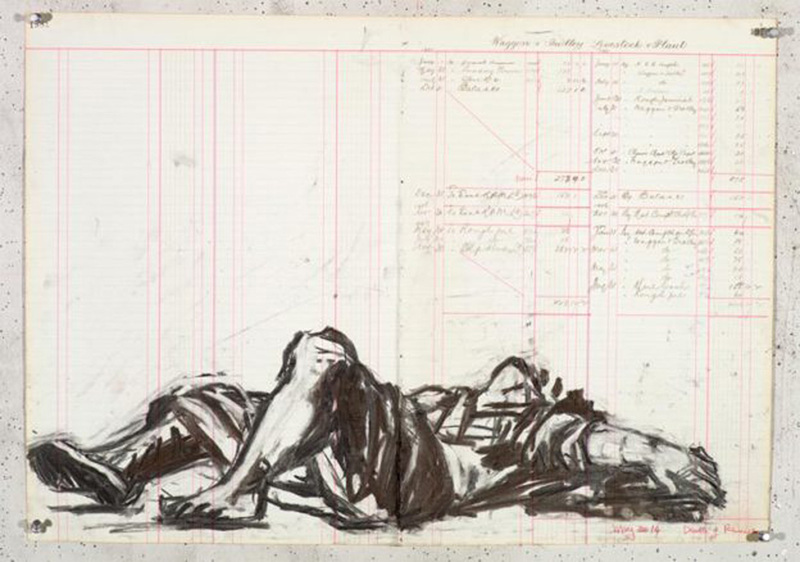 Now well known for his drawings, films, installations and opera productions; Kentridge’s work is multidisciplinary, with a career spanning four decades of exploration. Like an unfolding dream, to behold the artist’s work is to immerse oneself in a curious but intriguing trance; a story, told in a series of loose drawings which play out in animated sequences that disappear and reappear. Through this playful technique of layering and montage, successive images bear marks and traces of one another and in so doing the artist records the process of making as part of a narrative. Some scenes are recognisable, others quite bizarre. Sometimes it’s political, other times personal, but mostly his monotone work speaks to a gritty reality. The artist is known for his work that transcends the page; magnifying his studio sketches into the realm of animation and installation. 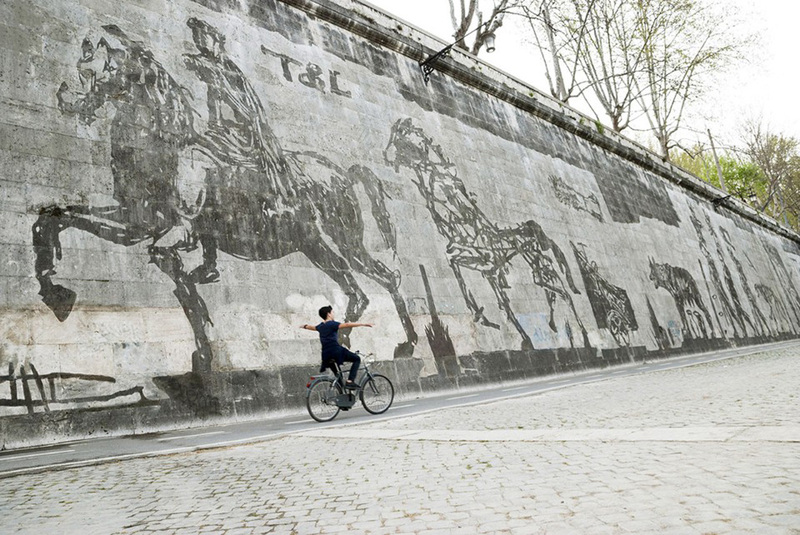 However, in 2016 he unveiled “his most ambitious project to date” in the city of Rome. The sheer scale of this blew me away! 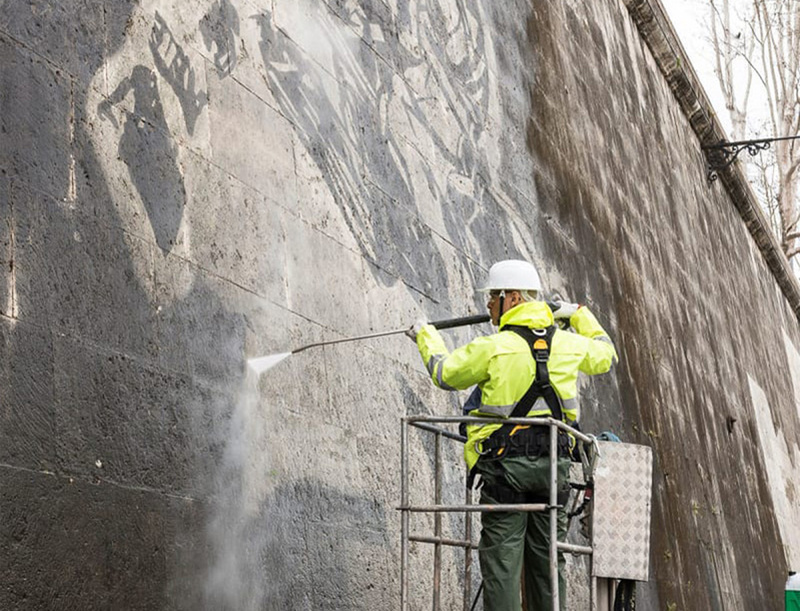 If his signature process of erasure in his animations hadn’t captivated me enough, this 550m-long giant frieze, etched (with a high pressure spray gun!) 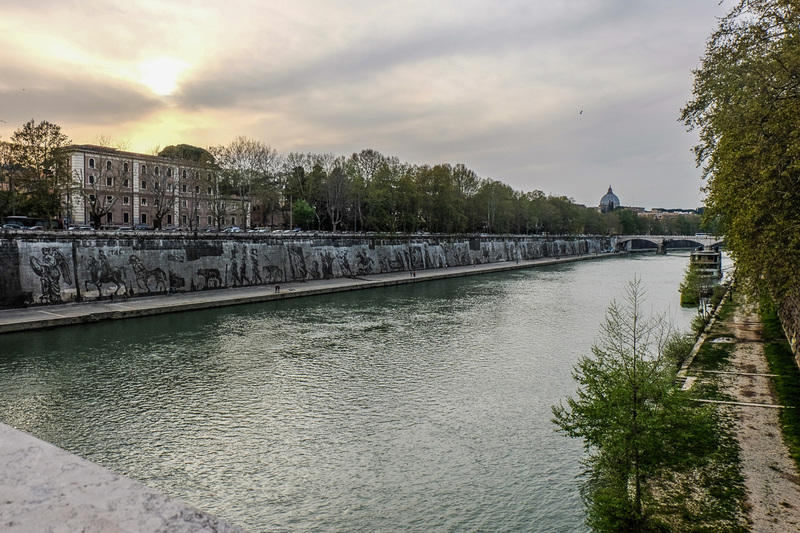 from the blackened mix of pollution and biological residue on the banks on the Tiber River, is quite remarkable. 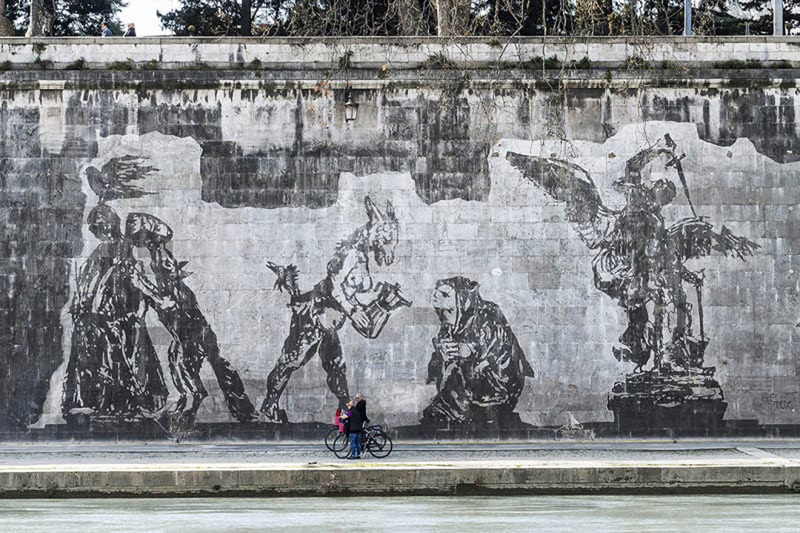 Entitled “Triumphs and Laments” a procession of sketchy silhouettes, up to 10 metres high, depict the glory and demise of a series of historical characters and events in Roman history. 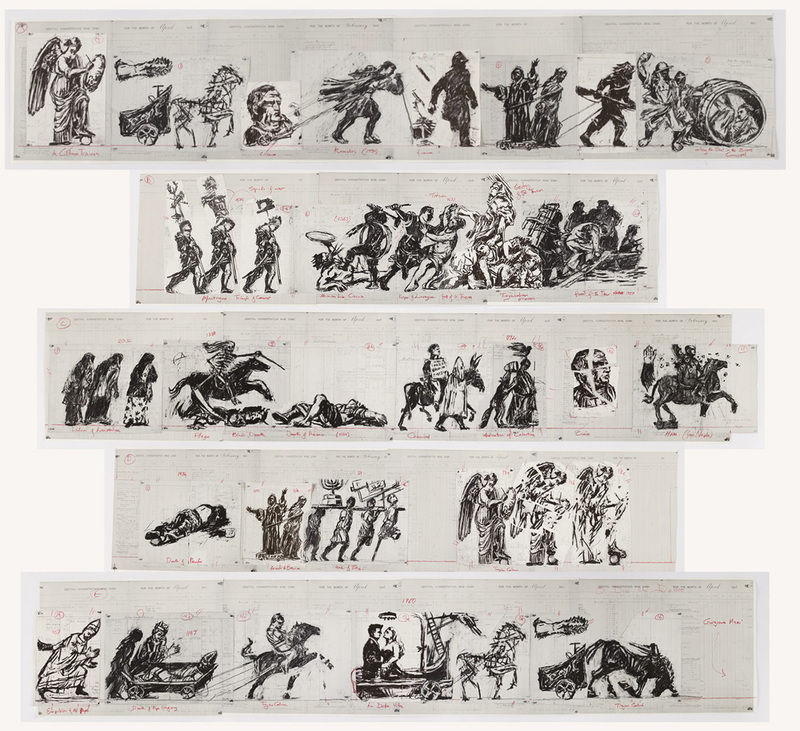 Rather than portraying a sequential timeline of specific events, Kentridge chose to make it personal by selecting a particular choice of characters from different moments in time. These are juxtaposed alongside one another, evoking memories of the mythology of city’s past. The work seeks to comment on the fact that for every victory there is a defeat. For every moment of revelry and rejoice, there is anguish and lament. Ordinary passers-by are dwarfed by the magnitude of the work, in fact, one can forgive the average pedestrian for not recognising the characters in the grit that clings to the walls of the travertine embankments. 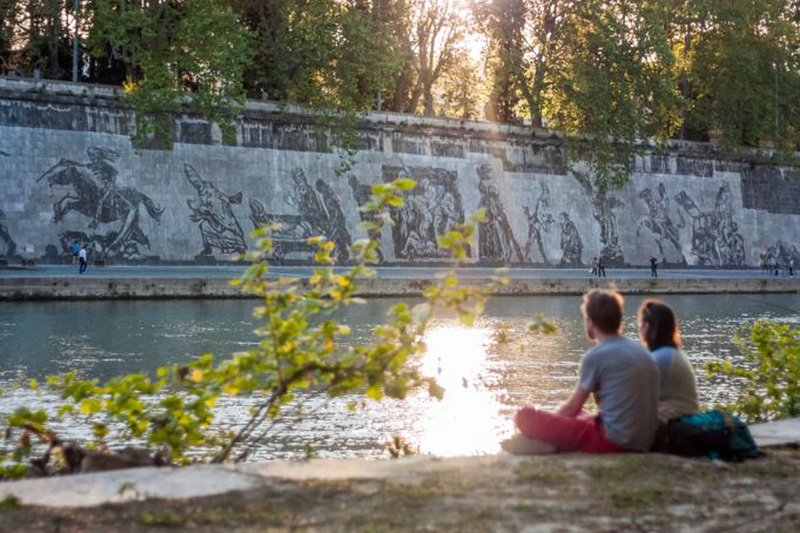 To call it an ephemeral monument is almost an oxymoron; whilst the scale of its man-made canvas renders it akin to other grand landmarks the mural’s ink is fragile. The organic patina of sketchy shapes and figures will be subject to the inevitable layering of mildew and build-up and eventually the piece will fade into its own part of history. This is not dissimilar to his early animated films, where the medium’s erasure is rendered a part of the narrative. Whether in application or erasure, I enjoy the fact that the process of drawing is a celebrated art in itself. 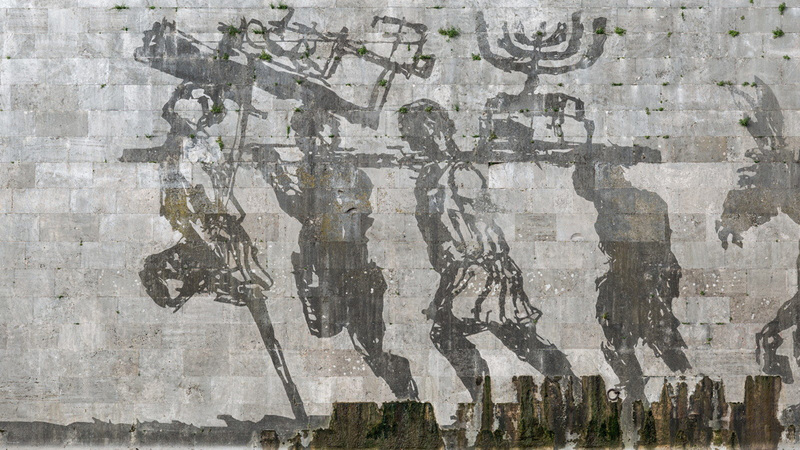 Kentridge reminds us that art needn’t be contained to a single medium, and can in fact be transient and ever-changing. Hopefully I’ll get to stroll alongside his urban sketches in person before this masterpiece of public art gently fades.